You should have some experience growing simple plants then start growing hydroponically. You need a little experience before you start hydroponic cannabis growing. When you move to Hydro it gives way better yields than other traditional soil growing methods. It also shortens grow times from start to finish. In hydro you concentrate to maximize your operation by taking advantage of all that makes cannabis crops turn out a maximum yield, like light, nutrients, co2 ventilation, and good cannabis seeds. Maybe use both hydroponic and soil growing methods to view the difference first hand. Keep it a secret. Don't let anyone know you're growing cannabis. The best way to get shut down is to tell people. You will save time in the cannabis grow cycle. Hydroponic cannabis growing takes a few less weeks than growing cannabis in soil. You'll be smoking buds way quicker. The cannabis flowers tops will also be bigger and juicier. Start to flower the cannabis plant at about 2 feet tall and during the flowering cycle it will grow twice as big. You don't really have to wait for a 6 foot tall plant. 4 plants can get you 1/4 pound dried and cured bud, but you also need to be using good yielding strains this means good cannabis seeds. Hydroponic growing requires some form of inert growing medium to support the plant, protect the roots from sunlight and to keep the root moist at all times. 1. Watch and adjust the pH level so that it always stays within the 5.5 to 6.8 pH range, optimum pH is at 6.3 - 6.5, and you should know that the natural tendency in hydroponics is an increase in the pH over time as plants use up nutrients, so you have to watch it and adjust it with either pH Down or Up chemicals which come in dry powder or wet liquid forms. 2. Change the hydro-water and re-supply the water with fresh nutrients (properly mixed) for whatever stage your plants are in every 10 days or so. 3. Root tissue should not be allowed to get too cold or too warm, maintain the nutrient solution at a minimum temp of 50 F at night, and 70 F during the day when the light are turned on, HID lighting produced heat, unlike fluorescent (which we do not recommend), yes you can grow under them, but you will need a lot of them. Unless you live in an area where the Police routinely fly over to check for heat spots, not a big deal, HID lights are also more efficient then any other available human made artificial source of light, and since you want to give it the best light to maximize your operation, you go with that, and that's that. Supply the correct lighting for the stage that you are in, and try to move air over your canopy to bring in fresh oxygen. I would stay away from buying CO2 bottles, instead you can buy Carbon in a liquid form and apply it directly to the roots on the plants by mixing it into the hydroponic water. CO2 bottles can bring unwanted attention to you, as you have to have them re-filled. Start with a single net pod system and play around with it and experiment, once you outgrow it, you'll know everything that is needed to make a kit and then you should be able to plan a larger kit to hold maybe 4-10 or more plants. 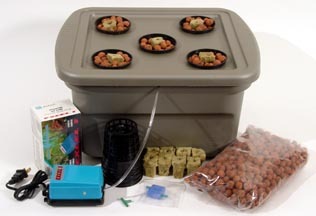 If you have no imagination and are low on technical skills, go to the hydroponic store, pull out your cash and buy a nice kit. 5 plant bubbler system from EZ Hydro Kit.